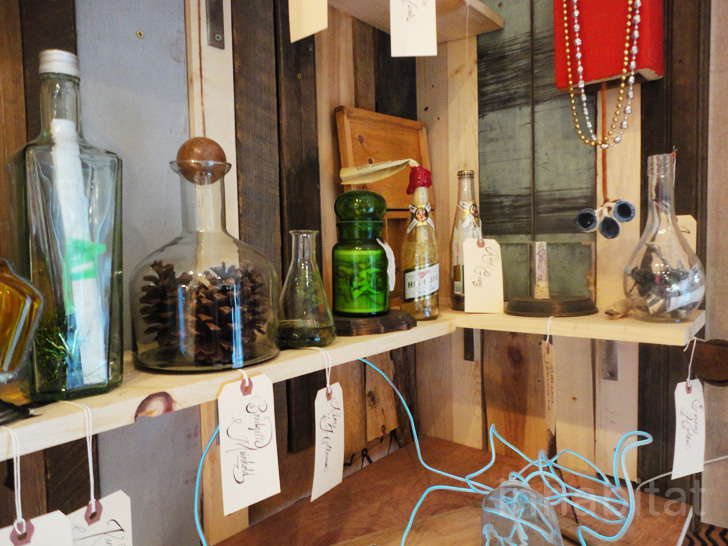 Dozens of artists transformed disused bottles into works of art for “Message in a Bottle,” an exhibition at SCOPE Art Show Miami last December. Put on by Quattlebaum Foretich Gallery and curated by Art Nerd New York, the exhibition transported visitors into an old time shipping chandlery. 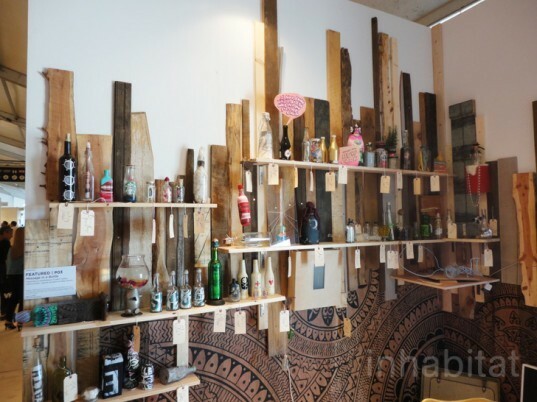 Along with walls clad in upcycled remnant wood, the exhibition featured eco-friendly work by artists such as Beau Stanton, Kenny Scharf, Ron English, Molly Crabapple, Inhabitat favorite Kim Holleman and even Inhabitat Architecture Editor, Bridgette Meinhold! “Message in a Bottle” asked 50 artists to use the ancient tradition of throwing a bottle into the sea as inspiration to convey their own messages. Each was asked to recycle a bottle of their choice, and transform it into a one of a kind piece of art that contained a message for posterity. Painters, woodcarvers, illustrators and sculptors tried their hand at creating a personal message from a discarded bottle. As visitors entered the exhibition, they were greeted by the rustic charm of alternating planks of remnant wood. The gallery sourced the planks from a local furniture maker, who planned to discard the remaining excess pieces. Adding a cobble affect, the planks were nailed to the walls and used to create shelving. Artist Beau Stanton also used recycled sustainable panels to create a gorgeous painted pattern along the walls. Each of the pieces in the exhibition showed the artist’s flair for conveying a creative message, but perhaps the most meaningful was that of Kim Holleman. Like much of Holleman’s work, her piece Frozen Lake brought up the issue of environmental destruction by creating a faux piece of nature inside a scientific beaker, implying a future of nature fabrication. After the exhibition, the wooden pieces were donated to a local woodworker to be used again. “Message in a Bottle” asked 50 artists to use the ancient tradition of throwing a bottle into the sea as inspiration to convey their own messages. Each was asked to recycle a bottle of their choice, and transform it into a one of a kind piece of art work that contained a message for posterity. Painters, woodcarvers, illustrators and sculptors were asked to try their hand at creating their own message from a discarded bottle. As visitors entered the exhibition, they were greeted by the rustic charm of alternating planks of remnant wood. The gallery sourced the planks from a local furniture maker, who planned to discard the remaining excess pieces. Adding a cobble affect, the planks were nailed to the walls, and also used to create shelving. Artist Beau Stanton also used recycled sustainable panels to create a gorgeous painted pattern along the walls. Each of the pieces in the exhibition showed the artist’s flair for conveying a creative message, but perhaps the most meaningful was that of Kim Holleman. Like much of Holleman’s work, her piece, Frozen Lake, brought up the issue of environmental destruction by creating a faux- piece of nature inside a scientific beaker, implying a future of nature fabrication. After the exhibition, the wooden pieces were once again recycled, and donated to a local woodworker to be reused.